Wargame is back with a second dose of free DLC for the million-selling franchise’s third installment, Wargame Red Dragon. In this new expansion for the spectacular real-time strategy game from Eugen Systems, which will patch automatically into the game today, 12 new units and an additional full-length story campaign are added, which takes the war to 1992 continuing the alternate-history narrative. Fielding some of the most advanced military technology of the time, The Second Korean War will see China, North Korea, and the Soviet Union pit themselves against the might of the United Nations’ coalitions. Armed with the Patriot missile system, the USA buffs their anti-air defenses, as do the Chinese with the JH-7. The South Korean K9-Thunder marches onto the field, to the detriment of the USSR’s elite Spetsnaz GRU infantry units. In the all-new campaign, a coup against Mikhail Gorbachev succeeded in 1991, a year prior to the events of the narrative. The former guard succeeds Gorbachev, and restores Soviet order, bringing them closer to the communist leaders in Asia, as leaders in the West grow ever-distant from the Soviet super-power. After a year of friction, the entire Korean peninsula is at war as the Soviets and UN coalitions take their increasingly distant ideologies onto the battlefield. And there’s more good news: Wargame is the Midweek deal on Steam! From tonight until Thursday, September 4, you can buy Wargame Red Dragon at an amazing 50% discount, while the price of the new Wargame Franchise Pack, which now includes all 3 Wargame games, has been slashed by 60%. 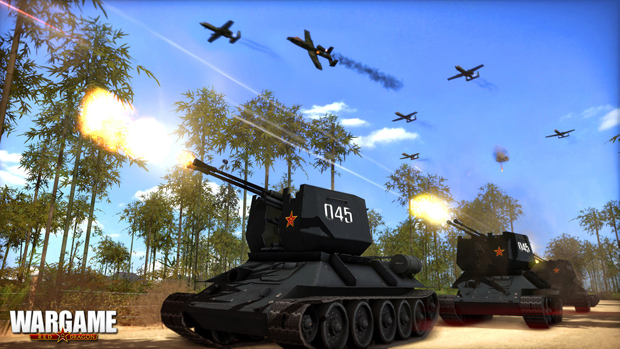 AirLand Battle and European Escalation, for their part, are both enjoying a 75% discount.